Few shotshells in modern history have the versatility and the utility of the .410 shotshell. 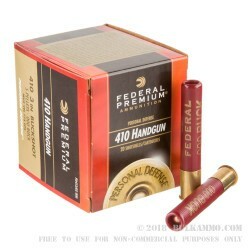 WIth the introduction of the Federal .410 000 Buck 3” Magnum, big performance now truly does come in small packages. Normally reserved for larger shotshells such as 20 and 12 gauge shotguns, the 000 buck loading of the Federal 410 gauge 000 Buck 3-inch Magnum is truly a force to be reckoned with. Five 000 buck pellets are uniformly and tightly packed within the .410 shotshell, and serve to transform a shotgun that has normally been reserved for varmint hunting and target practice, into an effective instrument of self defense. 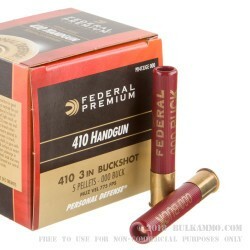 At a muzzle of velocity of 775 feet per second, the Federal .410 000 Buck 3” Magnum is not only one of the only 000 buck .410 shotshells on the market, it is also one of the fastest. Capable of being loaded in traditional break action .410 shotguns, the Federal .410 000 Buck 3” Magnum can also be loaded in Taurus Raging Judge revolvers for an even more portable form of self defense while on the move. High brass heads make for a truly outstanding degree of shell integrity, and at a degree of versatility that is hard to ignore, the Federal .410 000 Buck 3” Magnum is one of the most unique and powerful shotshells anywhere in the world today. Q: Ive seen that this product can be fired from the likes of the Taurus judge and the Mossburg shotgun. Apart from the obvious non rifling of shotguns, is there any other reason why you couldn’t fire a .410 and .45 from the shotgun in lieu of a slug? Does the shell cause as much gas expansion in the chamber as a standard cartridge? A: It would not be recommended to fire any ammunition through a firearm that is not stamped with that particular caliber or gauge. If you are unsure of what your shotgun could safely shoot, contacting the manufacturer would be the surest way to find out. 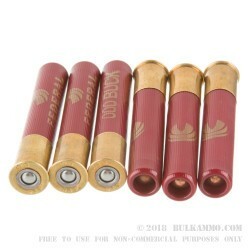 Q: Is it even possible to take a deer with .410 buckshot or is it solely (as labeled) for personal defense, and what would the effective range be on this ammo? Thank you! 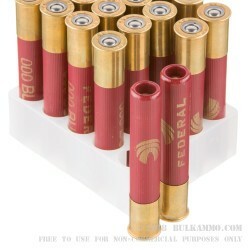 A: It would be possible to take a deer with this Federal 000 buck load. However, we would recommend a range of no more than 10 yards from a shoulder-fired .410 shotgun - perhaps less depending on your weapon. It would be a good idea to check the pattern at various distances before using it for hunting.